Posted bymike February 7, 2017 February 7, 2017 Leave a comment on Backpacking recipe – Chicken Quinoa. 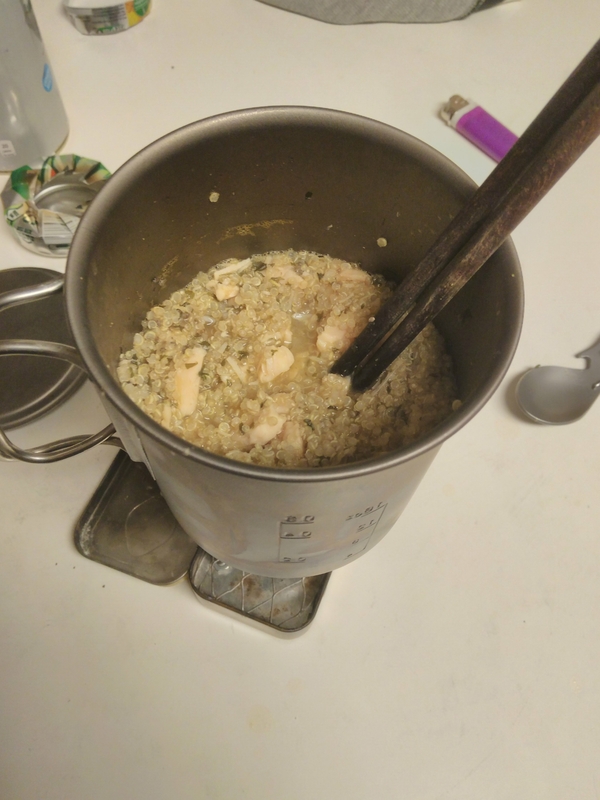 I tried a backpacking recipe on a soda can alchohol stove On my Altoid tin stove tonight. I rather liked it, so I am putting it here so I can find it again if I remember to look here. I used Lemon Essential oil because that is what I carry. I also used a tin can of chicken, water and all, so it was too wet, so I added some gelatin to thicken it a bit. Also, parsley instead of chives. It would have been better with the chives. Recipe is from http://www.wildbackpacker.com/backpacking-food/recipes/backpacking-dinner-recipes/ with more like it.